Mainframe programmers who wanted to dress up their programs with a bit of graphics, but were limited by the constraints of text-oriented machines, used cursor art. They still do. It’s the most compatible of all graphics techniques because it only requires a cursor and a few simple screen editing commands. Today, some people remember ANSI art and ANSImation from the heyday of PC BBSing in the 1990s. But there were other computer platforms with their own styles of text animation. In prior blog posts I have shared examples of VT-52 animation demos for the Atari ST platform. In this post, I’d like to share some examples of animation created with the Atari 8-bit’s ATASCII character set. I was a few years behind the curve when it came to computer technology. My family got its first hand-me-down Atari computers (800s) in the late 1980s. I didn’t often see Atari computers outside my own home. Imagine my surprise when, on my first day as a fourth grader, I learned my teacher had not one, but FOUR Atari computers set up in my class. Heaven. I remember she had a bunch of BASIC games, including a math game that made use of ATASCII text graphics to display an animated spaceship. I took bits and pieces from several of these games to make my own BASIC program. I don’t remember what it did, but I remember being so pleased with figuring out how to re-use those animated bits. My next brush with ATASCII animation came a couple years later when my cousin Uncle Ken gave us a 130XE that had belonged to my cousin Jeff. Among his many disks was one with the OASIS BBS program. I am not sure if OASIS came bundled with these animations as examples, or if Jeff downloaded them somewhere else. But I remember fooling around with the BBS software (before I had a modem), and watching the animations. Alas, these disks are long gone. Finally, I saw some ATASCII art when I began BBSing in 1992. I called several Atari 8-bit BBSes I had seen advertised in our local ACE-St. Louis club newsletter: Gateway City, The Word, The Pub II. All three of these BBSes used FoReM XE Professional and had ATASCII title screens. I think one or more might have offered a sort of “movie theater” of animations, but I don’t remember clearly. I recently had reason to research Matthew Ratcliff, known as Mat*Rat in the Atari community. I’ll write more about that later. But as I Googled, I came across a couple ANTIC articles that centered around Ratcliff’s “Atari ‘Toons” program, for creating ATASCII animations. Ratcliff’s article concludes with a snippet of BASIC which could be used to play back Atari ‘Toons animations from within in readers’ own BASIC programs. He mentions helping a St. Louis-area sysop do just that, modifying the sysop’s AMIS BBS to add a “movie of the week” section. 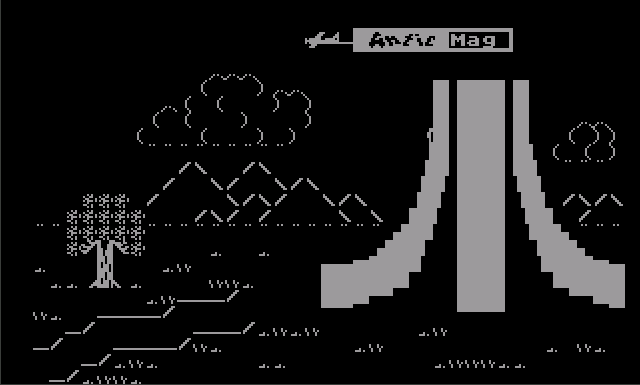 As was common in the 1980s, “ATARI ‘Toons” was printed as a series of BASIC program instructions, which readers could type in and save on their own computers. Some subscribers paid extra for a disk subscription, and received these programs on the August 1985 disk. ANTIC created a contest and invited readers to submit animations for a chance to win a 1200-baud modem. Six winners were announced in the Feb. 1986 issue. Brian Hastings took first place for his slapstick “Class” animation. I made video captures of each of the ATASCII animations published in the Feb. 1986 issue of ANTIC. I played them back using an emulator called Atari800MacX and captured them using iShowU. Do you remember ATASCII art? Did you call Atari 8-bit BBSes? Did you make or enjoy ATASCII art or animations? Share your story in the comments. Thanks for capturing, researching and sharing! Keep up the good work, Josh. We’ll spread the word. Oh man, memories. I watched many ATASCII animations back the 80s, probably on the Party Palace BSS (516). I specifically remember one about wrestling. Wish I could find it.